ALWAYS SPREADING THE BRAIN FOOD LOVE! This is a special Brain Food Dinner Party. We are incredibly excited to partner with SAIT (that’s the Southern Alberta Institute of Technology) for our latest brainy dining event. SAIT is recognized as one of the best Hospitality and Hotel Management school in the world and the only school in Canada on this Top 50 list! And we are honoured to work with THE NEXT GENERATION of chefs who are about to graduate from SAIT’s leading-edge culinary program. We will be working directly with SAIT chef instructors Chef Andrew Hewson and Chef Kelsey Oudendag to make sure the food is perfect. We will also be working with SAIT’s manager of continuing education and community engagement, James Werner, to ensure the event and experience are flawless. Andrew, Kelsey and James have worked at incredible restaurants locally and abroad and are now living their passion of teaching up-and-coming chefs in SAIT’s culinary program. And THEY will be bringing their best talent to the table. Literally. We are going to get the best culinary students to put their brains together and add the most modern, youthful, fresh approach to brainfood we’ve ever done at NeuroTrition! LEARN HOW TO EAT TO FEED YOUR BRAIN AND MENTAL HEALTH! Because our events always aim to nourish your belly AND your mind, the menu will not only be delicious and decadent, it will also be thought-provoking. We will teach you how to eat to fuel brain and mental health, so you can then spread the love to your friends and family. Each course will be thoughtfully created and prepared to showcase how we get our clients at NeuroTrition to eat in a more balanced way for their own brain and mental health. We will be using some of the top brain foods out there that science says can positively impact how we feel, think and perform. And we are going to make them taste incredible. Because eating for your brain doesn’t have to be boring. And we’re on a mission to show you just how inventive and fun brain-healthy eating can actually be. We always recommend that you eat more in-line with our NeuroTrition Rx (our prescription that perfectly pairs neuroscience and nutrition), even if you’re not looking to support a specific brain or mental health condition. So we want you at this event, to learn how to deliciously add more brain-friendly foods to your and your family’s lives. We have 100 tickets up for grabs to this brainy food and drink event (that includes 4 courses and 4 custom pairings!!) so please book now to ensure you get a seat. SAIT Chefs Andrew Hewson and James Werner, and NeuroTrition’s Orsha Magyar will be co-hosting this event, introducing each dish as it comes out as well as answering any and all of your burning foodie and brainy questions. 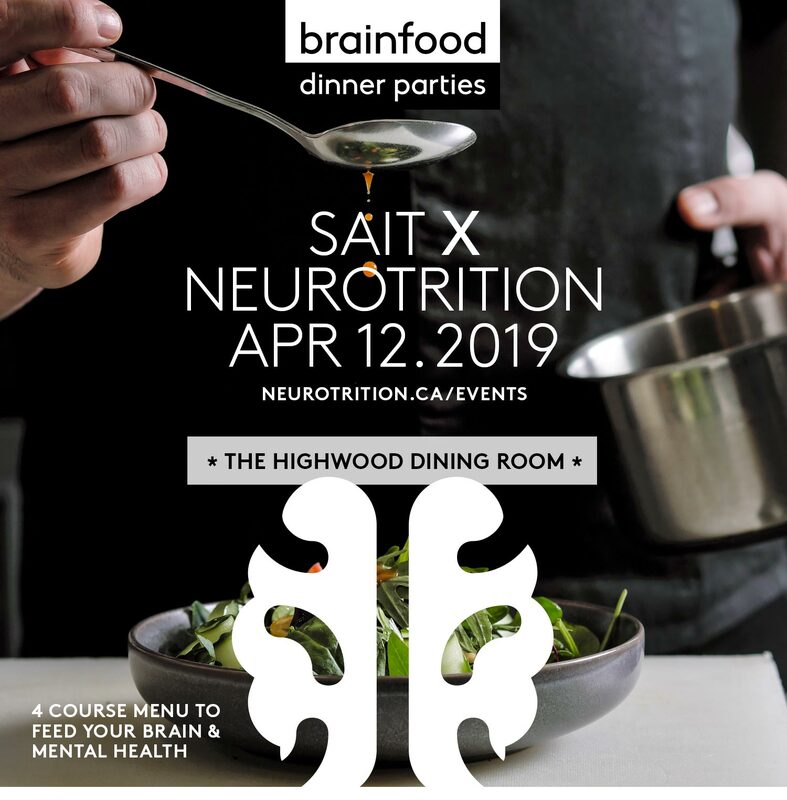 We really hope to see you for this awesome Collab between NeuroTrition & SAIT. Please email orsha@neurotrition.ca with any questions you may have. The ticket includes: a 4-course dinner and 4 pairings custom created for this event. As always, we can accommodate any and all dietary restrictions and preferences, just fill it out on the registration form when we ask!